The Writing Bug: Writer’s Block? We Don’t Need No Stinking Writer’s Block! Writer’s Block? 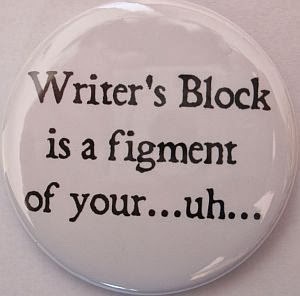 We Don’t Need No Stinking Writer’s Block! I started writing my blog for this week on five separate topics. So I have five ideas, one paragraph each—all dead in the water. Why? None of them seemed very good and I had no idea how to develop any one of them into a decent blog. None of the things I usually do to summon my muse were working. (See Waiting for the Muse, January 15, 2014). Last night I told my husband, “That’s it. I have no ideas at all for this blog.” He asked me if he could help—could he read what I’ve written so far? “Well what have you written about in your earlier blogs?” he asked, trying to be helpful. I told him. Then I started thinking, What if I have no more ideas for this blog? What if I’m completely tapped out? After only four posts? But I knew it was dangerous to let the “panic pixie” take hold. A few minutes later my husband finally said, “Why don’t you give it up for tonight and ‘let the boys in the basement do their work’?" "So-called higher thought is, by and large, highly overrated. ... It’s generally better to just stand aside and let the boys in the basement do their work. That’s blue-collar labor down there, non-union guys with lots of muscles and tattoos. Instinct is their specialty." Which I take to mean, “Stop trying to over-think it. Let it go and something will come to you.” Well, I'm no best-selling author, but the advice makes sense, so I decided to let it go and get a good night's rest. When I woke up this morning, I went to my study, opened my small notebook entitled, "Shirley's Really Great Ideas" and starting writing down my thoughts as fast as I could. Hold on boys, I thought. I don’t take shorthand. Indeed, the boys in the basement had been working hard all night. And with a little luck, and some work on my part, I’ll share some of those ideas with you in future blogs. Excellent post. Thank you! Its good to know that I'm not the only one with six or seven half-done assignments just sitting there. Sometimes I think we underestimate what our "basement workers" are capable of. This is exactly what I do when I can't think of something to write for my own blog, but since I'm not a fan of Stephen King, I never thought of it quite that way. May the boys in the basement bring you many wonderful ideas. Thanks everyone for your comments! May the boys in your basements do their thing! p.s. Patricia: have you really written that many posts? Or am I just being gullible? Either way, best of luck on the next one!